Founded in 2011, Buddy Equipment manufactures the Buddy Bench, Buddy Desk and Buddy Cabinet a range of products designed to help the DIY and hobby enthusiast use available space more effectively. In 2014 the manufacturing and sales of Buddy Equipment was licenced to Learn to Earn, a skills development and job creation Not for Profit. Buddy products have been designed to be an ideal solution to the work surface needs of homeowners, DIY enthusiasts and hobbyists who are frequently challenged by the lack of a suitable work space. In tune with what their customers were saying, and in order to meet their needs, they adapted the heavy duty workbench design to the development of a stylish and spatially efficient fold away desk or craft table specifically for interior use. Quality has been of paramount importance throughout the development process and the superior standards both in appearance and structure of the workbenchs, has rendered the products suitable for installation in living spaces (studio apartment/study/spare bedroom/kitchen etc) or in storerooms, parking garages or workshops, but with the unique feature of giving the space back to the user when it is not in use. 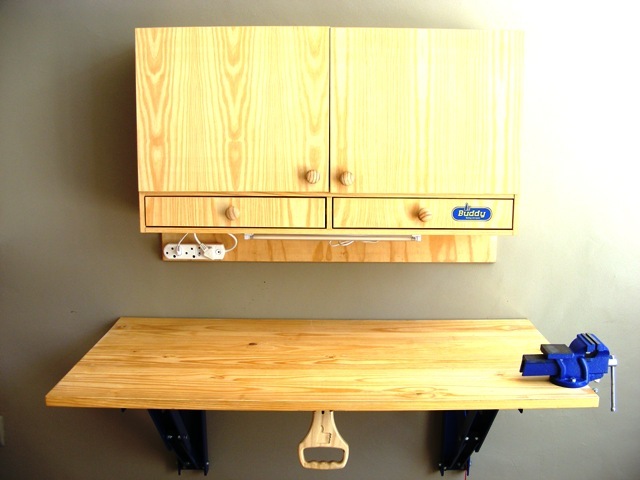 The workbench inspires the design, manufacture and supply of a wider range of complimentary products such as storage cabinets, shelving, and other home ware items etc. which are all available for purchase via our on-line order process. Our Buddy Bench and Buddy Cabinet products may be viewed in store at Shelf Space, 5 Star Junction, Corner Beyers Naude Drive & Juice Street, Honeydew, Johannesburg or at the Building Centre, Platinum Street, Northgate Estate (Adjacent to Builders Warehouse) Ysterplaat, Cape Town. What we like about the Buddy Bench is that it can be packed away, although permanently fitted, are easily set-up, used and packed-away. They also have inside of house use, like for people wanting to do crafts without messing up the dining room table...we guess anywhere space is limited. And in addition they support a great organisation....read below. Based in Khayelitsha and Hermanus, Learn to Earn works with unemployed people from disadvantaged backgrounds. With their motto of ‘a hand up - not a hand out’ they seek to develop people especially unemployed people, socially, economically, emotionally and spiritually. Through providing a programme that recognises human dignity and the right to live a meaningful life, they aim to assist those attending their skills development courses to regain their self- respect. Since establishment in 1989 they have trained over 10 000 unemployed South African in market related skills. Their various initiatives include: The Business Resource Centre E³, The LtE Association, The CoCT Training Project and The Feel Good Project (a social enterprise partnership with TFG). In 2014 Learn to Earn celebrated 25 years of serving the unemployed through skills training and job creation while facilitating the restoration of dignity and self-respect. Buddy Equipment falls under the BRC and all profits generated go towards sustaining the organisation. For information on LtE, the courses they offer and their other initiatives please visit their website: www.learntoearn.org.za or Facebook page Learn to Earn South Africa.